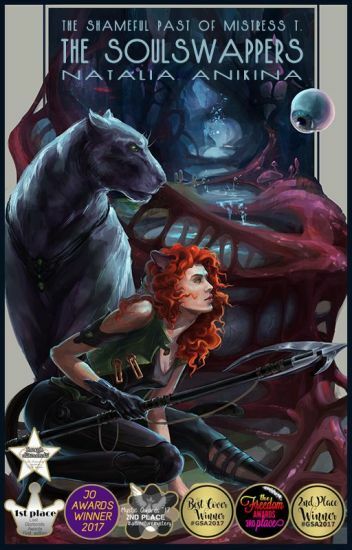 The Shameful Past of Mistress Т.
Talia an Kamian, feline aristocrat and a telepath moves her residence to Enhiarg's darkest and most blood chilling city, Lennes, in hopes of fending for her own bread, butter, and mice. Accompanied by her bewitched friend and mentor Enaor, a sizeable black panther, who wears and an anti-magic collar at all times, they quickly befall a series of mysterious chain of events. Talia's employer, a headmistress of the orphanage is convinced by unseen forces to fire Talia at all cost. To protect her reputation Talia, Enaor and a band of newfound friends follow dark caves to the heart of Leness's most dangerous sapient mushroom spawn, known as Somyum. Join Talia on her journey and new life in Lenness, the Abyss. An underground city comprised of fiery lakes, jellyfish-portals, thieves, murderers, crazy scientists, and a lot of magic. Cover by Olga "Oma Om" Morozova. I want to battle each problem one at a time, starting with sexism. Welcome to Girl & Boys. Jake and Luke have escaped prison. What will happen now? The English translation of the Wattpad Featured & Wattys 2015 Winner story. ... And the moment you allow that tiny evil enter your heart, the moment you act in a manner unbefitting your race, the moment you start complaining about life - they will see you. And a woman beast with glowing eyes and sharp fangs will come to you. She will bewitch you with tales that all the evil in you is actually good, and she will drag you away into her den - an abode of vice on the cursed blue star, devoid of warmth and true light, with only hatred and bloodlust to keep you warm. With a cold flame they will burn your soul, stripping it of beauty and nobility, compassion and honor. So foul will your form become that even your friends will begin to hunt you like a beast, for a soulless beast you will be. Cover by Olga "Oma" Morozova. Hello. My name is Dustin. And this is my confusing life. I don't know what's wrong with me, but I know that I feel different. Different to others. Different to who I was. Different to all the 'sicknesses' that have my symptoms. I'm scared. Dustin gets bullied. He's hurt, But deep inside. He doesn't know what he's feeling. -He doesn't know he's hurting, all he knows is he's scared, and he has too many emotions. He doesn't feel bad. He feels as normal as ever. But there's something else. He's just scared. Scared. He feels different to how everyone else looks. He feels too real to be, well, real. A/N: This book is inspired by events from my life. Please, if you are bullied or made fun of or, if you feel sad, please feel free to message me. We can talk. I'm always open. This may be a slightly triggering story. If you feel you can't handle bullying, depression, etc. Don't read this. If you feel you can't handle people making fun of others, of depression, race, sexuality, etc. Please Don't Read this. I don't think any of this personally, it's not my opinion, but it is part of the story. So, you've opened the book, The Cat Who Knew How to Cry, and found yourself in Enhiarg. You quickly found your bearings, figured out what's what, and now feel like a kid in a candy store. Sound about right? Excellent! Then I'm happy to tell you that I've got another treat for you, a delectable one that still packs quite a punch - A Theater for Shadows. I hope you'll like it! However, if you found Cat to be a hard nut to crack, you may find this guide beneficial. It will help to make sense of many lingering questions. For instance, how is "soul" different from "spirit"? Who is the Infinite? Are not the Nae divine? Why is the Abyss such a free-for-all? Who are the Alae, Tanae, and so on? And how do you keep from drowning in the vibrant madness of this extraordinary world, anyway? Rain is going through a lot. She doesn't feel like doing anything. Her friend makes her go to a party. She leaves the party and is attacked. Once she wakes up she's somewhere she's never been before. Please read this. I know the pro-logue is really bad but please give my book a chance. It is a random book of stories combined with poetry. The main topic is about life. Life is complicated. Isn't it? The girl of the story doesn't care about the odd things of life. She tries to enjoy every moment and every seasons she sees. Let's see what life holds for her. Hope you would love it.